Ben's Journal: So this is inappropriate? Oooooh, what spicy content did she send me? I go ahead and risk it, by clicking "Yes," I want to continue and am greeted with this? 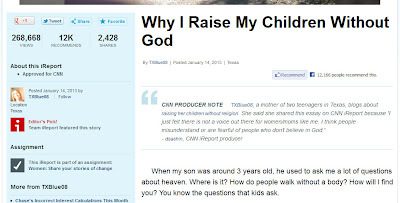 The article, as you can see from the headline, outlines why one mom has opted to not teach her child about G-d. 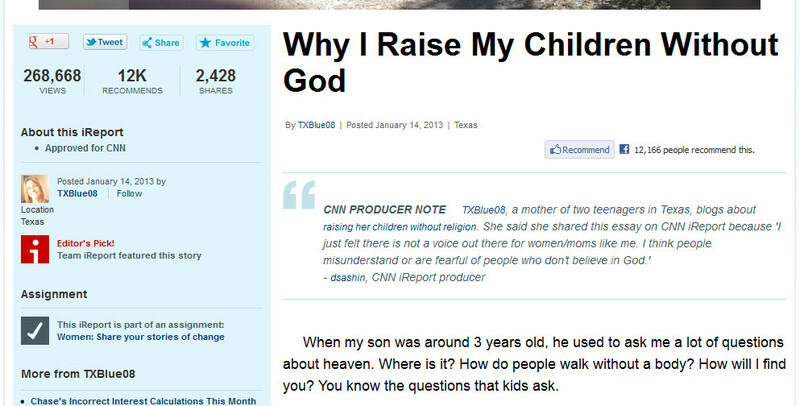 It's actually a fairly direct and terse article about the reasons why someone might embrace atheism. Agree with the content of the article or not, I just can't get over the fact that the article is marked as Under Review. 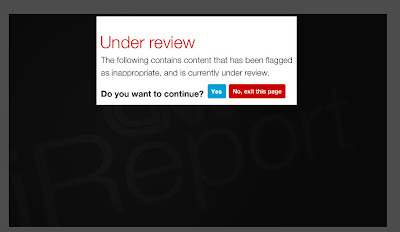 The simple explanation is that the content was repulsive to enough people the inappropriate button was hit so many times, an automatic review was triggered. If this is indeed the case, this is amazingly sad. Surely people who clicked inappropriate realize that one of the most precious rights we have is that of free speech, and that this person is exercising just that? Sorry to get all preachy, but this is one of the features that makes America great: you can say things others don't agree with, and do it without fear. Squelching opinions, especially those related to religious matters you don't believe in, is supposed to be the agenda of totalitarian regimes, not the American populace. I respect there may be other explanations. Perhaps an article that garners 135 pages of comments is automatically put in review. Heck, perhaps other atheists clicked on the inappropriate button to make those of faith commenting on the article look like a bunch of loonies. Still, reading the comments doesn't exactly reinforce these other theories. You know, there's this rule I remember hearing about, the one about treating others they way you want to be treated. Yeah, that could be handy right about now. You know, treating others with respect and honoring their right to publish, so that you'll have that same respect and right later on.